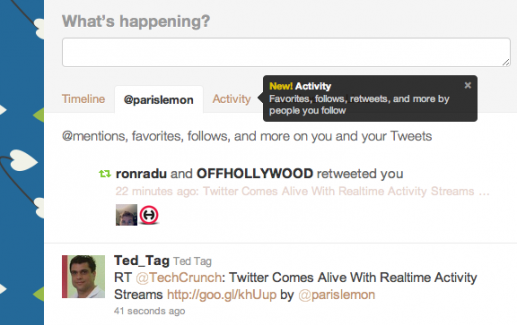 Tech Crunch has just reported "Twitter Comes Alive With Real Time Activity Streams". They highlight, with the above image, the birth of the new tab, called 'activity', which will sit alongside an @ username tab. As we are huge fans of what we class as "networks of interaction", we really love this development and are looking forward to the UK roll out. Find out more about the Real Time Activity Steams over at the Tech Crunch post.